One popular space that we have seen augmented reality take hold is in the gaming world. Pokémon Go, for example, hit the mainstream just a few years ago and took off running. However, AR has stepped out of solely being in the gaming world and has become more and more present and important in the real world today. AR has been transformative in many areas, including education, healthcare, industry and at home, to name a few. Augmented reality (AR), sometimes known as Mixed Reality, is a technology that can be interactive. It creates virtual elements overlaid into a real-world object or environment. To do this, AR takes advantage of a device’s microphone, camera, the location sensor, data connection, or another sensory component. AR usually works using a head-mounted display (HMD) device or head-up display (HUD) device, tablet or smartphone. However, sometimes, we can experience AR through projectors, tables or even everyday items like lamps. While virtual reality (VR) replaces the real world, augmented reality compliments the real world. When AR has been used in education. it can make a big difference. It can excite children, and make their learning experience more enjoyable. Some studies have shown that low-performing children that begin to learn with AR bridge the gap to join higher-performing students. AR in healthcare offers a way for care providers and insurance companies to improve patient outcomes and reduce costs simultaneously. For example, Cigna’s BioBall Program uses Microsoft’s HoloLens smart glasses for an interactive game that tests people’s body mass index and blood pressure. The overall outcome is to help patients take better control of their well-being, in a fun, interactive way. Of course you can find AR used in a home or office setting. Besides the early adoption of AR headsets and eyewear, people are using AR in a number of different ways. For instance, one application allows you to interact with Web apps on any surface, like a desk, by simply hooking up a projector and depth camera to a light fixture. Some online stores, like Ikea, allow you to visualize their product in your home. 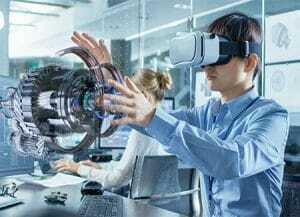 AR is also definitely being used in industry in areas such as staff training, quality assurance, equipment maintenance, and data management. It is evident that augmented reality has a wide-range of influence all over the world. The technology blends real-world environments with virtual objects and features in real time. Not only is AR fun, but it can help with problem-solving and improving the way we work, play and live.